"This dish is zesty and yummy! It is very easy to make, as well as very deserving of 3 exclamation points!!! 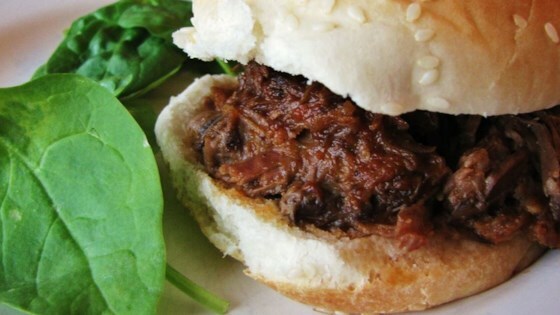 Spoon meat onto toasted sandwich buns, and top with additional barbecue sauce." In a large bowl, combine ketchup, brown sugar, red wine vinegar, Dijon-style mustard, Worcestershire sauce, and liquid smoke. Stir in salt, pepper, and garlic powder. Remove chuck roast from slow cooker, shred with a fork, and return to the slow cooker. Stir meat to evenly coat with sauce. Continue cooking approximately 1 hour. Watch how to make this zesty dish.